Members of the phylum Cnidaria possess radial or biradial symmetry. Biradial symmetryis a modification of radial symmetry . In this case, a single plane passing through a central axis, divides the animal into mirror images. Biradial symmetry is formed due to presence of a single or paired structure in a radial animal. The dorsal and ventral surfaces are not differentiated in biradial symmetry. Therefore, it is different from bilateral symmetry. Radially symmetrical animals have no anterior or posterior ends. The end of the animal that contains the mouth is called oral end. The opposite end is called aboral end. The sensory receptors are evenly distributed around the body in radial symmetry. Therefore, it has advantage for sedentary animals. These organisms can respond to stimuli from all directions. They have radial or biradial symmetry . They have diploblastic and tissue-level organization. They contain gelatinous mesoglea between the epidermal and gastrodermal tissue layers. A gastrovascualar cavity is present in them. Nervous system in the form of a nerve network is present. Specialized cells called cnidocytes are present. They are used for defense, feeding and attachment. Cnidarians possess diploblastic and tissue-level organization. Cells organize into tissues. The tissues carry out specific functions. All the cells are derived from two embryological layers. (a) Ectoderm: The ectoderm of the embryo form an outer laver of the body wall called ectoderm. (b) Endoderm: It forms gastrodermis. Gastrodermis is the inner layer of body wall. 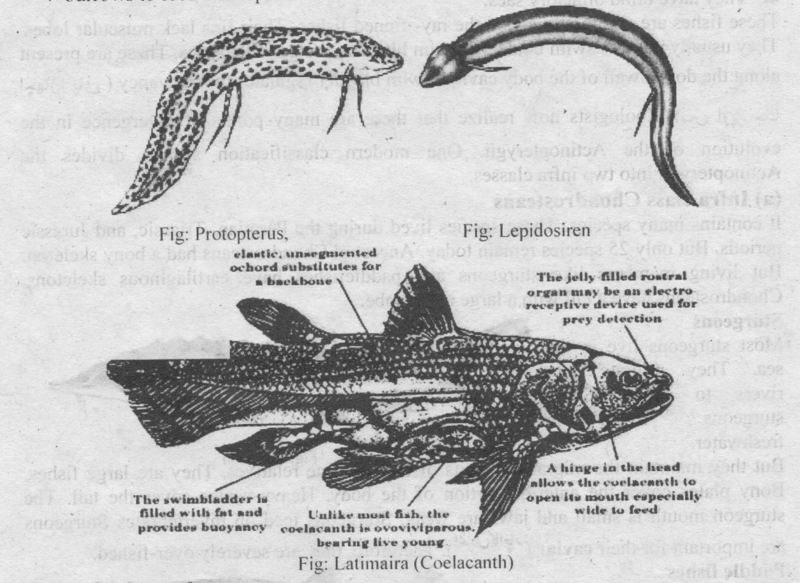 (c) Mesoglea: A jellylike layer is present between the epidermis and gastrodermis. It is called mesoglea. 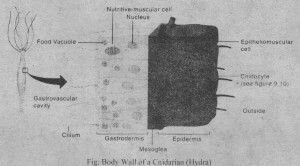 Cells are present in the middle layer of some cnidarians. But these cell have their origin in the epidermis or the gastrodermis. Cells of the epidermis and gastrodermis differentiate into a number of cell types. These cells are used for protection, food gathering, coordination, movement, digestion. and absorption. Nematocysts are characteristic of the phylum cnidarid. 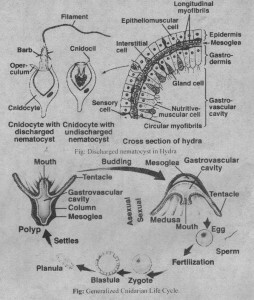 Nematocysts are produced by special cells called cnidocytes. Cnidocytes are epidermal or gastrodermal cells. 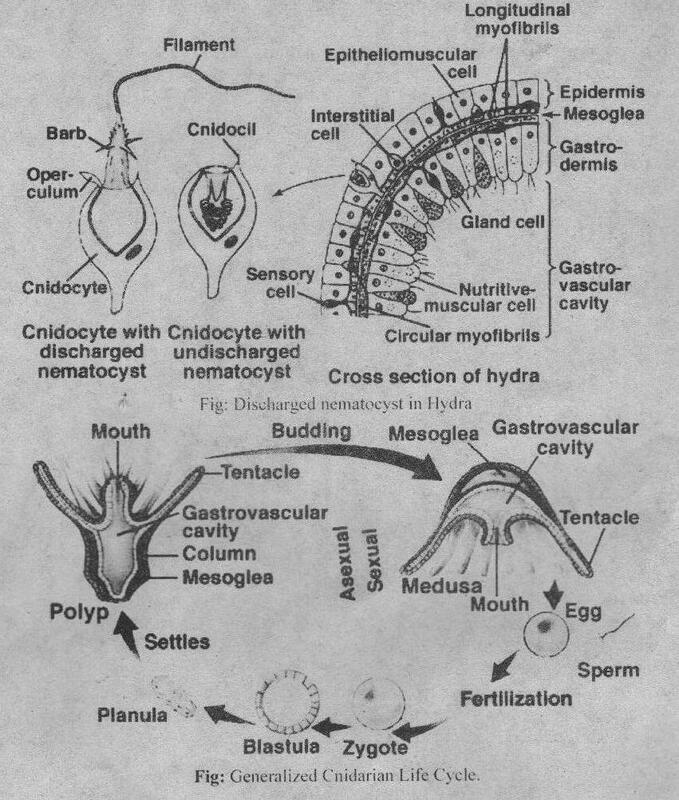 Nematocysts are used for attachment, defense and feeding. 1. Nematocysts with a long tube armed with spines: These nematocysts are used lot food gathering and defense. They discharge their tube and penetrate the prey. The spines have hollow tips. It injects paralyzing toxins into the prey. 2. Nematocysts with unarmed tubes: The tube wrap around prey or a substrate. Nematocysts with sticky secretions: These secretions help the animal to anchor itself with substrate. (a) Polyp: The tube like zooid is called polyp. The polyp reproduces asexually It is sessile and attaches to a substrate at the aboral end. It has a cylindrical body called the column. Its mouth is surrounded by food-gathering tentacles. (b) Medusa: The umbrella like zooid is called medusa. The medusa is dioecious and free swimming. Its shape is like an inverted bowl. The tentacles hang from its margins. The mouth opening is centrally located at lower side. The medusa swims by medusa than in a polyp. It gives the medusa a jellylike appearance. The gastrodermis of all cnidarians lines gastrovascular cavity. This cavity performs the function of digestion, exchange of gases removal of metabolic wastes, and the discharge of w metes. Food, digestive wastes and reproductive stages enter and leaves the gastrovasvcular through the mouth. Nemocysts entangle and paralyze prey. They are contractile cells in the tentacles. These cells contract and shorten tentacles. Tentacles draw food toward the mouth. A nemocysts develops in a capsule.The capsule is caped at its outer margin by an operculum. The operculum is displaced and nemocysts is discharged. The cnidocil is responsible for nemocysts discharge. The cnidoil is stimulated when it touch the prey. A rapid flux of water enters into cnidocytes. It first averts the base to tip. The tube involves at enormous speed as the nematocyst is discharged. The nematocysts are armed with barbs. These barbs are helpful in the penetration of nematocysts. Food enters the gastrovascular cavity. The gastrodermal gland cells secrete mucus and enzymes. It makes food like soup. Some nutritive-muscular cells are present among the gastrodermal cells. These cells partially digest the food by phagocytosis inside the food vacuoles. The digestion is completed inside the food vacuole. Nutritive-muscular cells also have contractile fibres. These fibers move the materials into or out of the gastrovascular cavity by peristaltic contractions. Ring like contractions move along the body wall during peristalsis. It pushes contents of the gastrovascular cavity and expels undigested material through the mouth. Hydrostatic skeleton: Water around cnidarians provides them support. Additionally, a hydrostatic skeleton helps in support and movement. In the Cnidaria, the water-filled gastrovascular cavity acts as a hydrostatic skeleton. A hydrostatic skeleton is composed of water or body fluids in a cavity of the body. The contractile elements of the body wall act against this hydrostatic skeleton. Some epitheliomuscular cells of the body wall are contractile. They help in movement. Mechanism of action: The polyp closes its mouth and contracts longitudinal epithellomuscular cells on one side of the body. The polyp bends toward that side. Now these cells contract while the mouth is open. Thus water escapes from the gastrovascular cavity. Therefore, the polyp collapses. Contraction of circular epitheliomuscular cells causes constriction of a part of the body. The mouth is closed and water in the gastrovascular cavity is compressed. Therefore the polyp elongates. Locomotion of polyp: Polyps use different type of locomotion.They may move somersaulting. They somersault from base to tentacles and from tentacles to base again. Or they move in an inchworm fashion. They use their base and tentacles as points of attachment. Polyps attach at their base or walk on their tentacles. They ma also glide very slowly along a substrate. Locomotion of Medusae: Medusae move by swimming and floating. Water currents and wind are responsible for most horizontal movements. Vertical movements occur by swimming. Contractions of circular and radial epitheliomuscular cells produce rhvthmic pulsations of the bell. It drives water from beneath the bell and .propels the medusa through the water. Nervous System: The cnidarian nerve cells are the most primitive nervous elements tn the animal kingdom. The zoologists are studying the evolution of animal nervous systems by the study of these cells. Nerve cells are located below the epidermis near the mesoglea. They interconnect to form a two-dimensional nerve net. This net conducts nerve impulses around the body. The response is localized. The spreading of nerve impulse over the body depends on stimulus strength. For example, the poly withdraw it tentacle in response to a weak stimulus. But it withdraw entire polyp in response to strong stimulus. 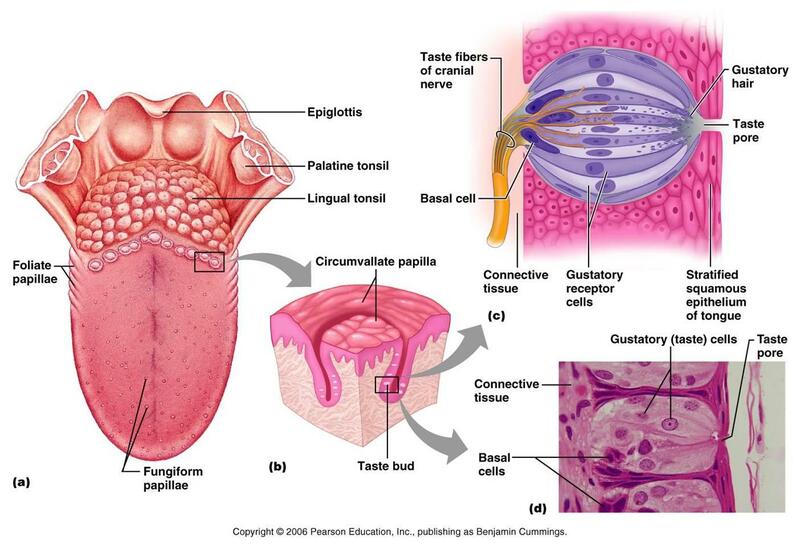 Sense organs: Sensory structures of cnidarians are distributed throughout the body, These receptors are used for receiving the stimulus of touch and certain chemicals. More specialized receptors are located at specific sites on a polyp or medusa. The cnidarians have large surface-area-to-volume ratio. All cells are preset at a short distance from the body surface. Therefore oxygen, carbon dioxide and nitrogenous wastes exchange by diffusion. Sexual reproduction: Most cnidarians are dioecious. Sperm and eggs are released into the gastrovascular cavity or to the outside of the body. In some cases, eggs are retained in the pa cut until fertilization. Blastula is formed early in development. There is migration of surface cells to the interior. The cavity of embryo is filled with these cells. These cells form the gastrodermis. The embryo elongates and forms a ciliated and free-swimming larva. This larva s called planula. The planula attaches to a substrate. Its interior cells split to form the gastrovascular cavity and a young polyp develops. Asexual reproduction: Medusae is formed by budding from the body wall of a polyp. The new polyps are formed from other polyps by budding. Buds may detach from the polyp Sometimes, they may remain attached to the parent and form zooid of the colony.